As it is with all our work outdoors, we revisited the site the day after installation to see how things were going. 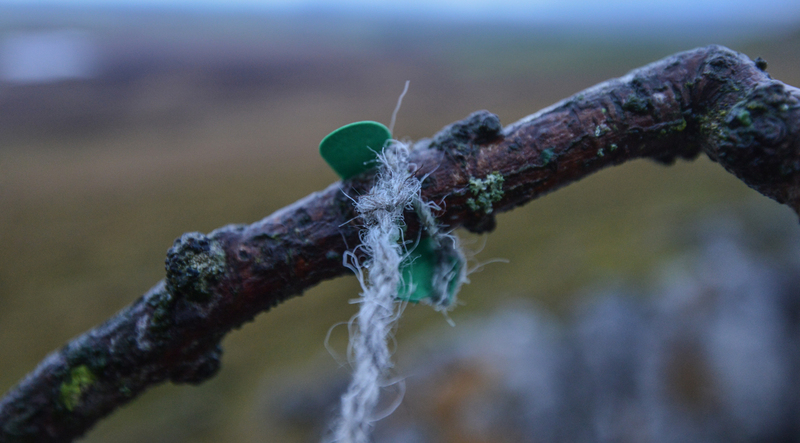 We had hung the leaves on the Little Asby Hawthorn in a glowing sunset and walked off the fell when the air was still. But overnight the winds gathered power and the sky hurled rain over Cumbria. Rain continued through the morning. When we arrived we discovered a few leaves lying beneath the tree. They had come loose. We were surprised to see this, as in our late Spring tests we had removed intact leaves after many weeks of life outside. But we always knew that this piece of land gets particularly high winds – the shape of the tree is like a statement of wind speed and direction, and its own tiny leaves seem to struggle to hold on. We didn’t want to create litter and decided that the best thing to do would be to remove all the leaves, so we set to work and carefully untied them. For an instant, we wondered whether this was a shame to remove them so soon, but unexpectedly, it felt just right. Each dedication had been read several times, its message affirmed and reaffirmed. Each one had been thought about and written down, it had been read aloud when we received it, read again when we threaded the leaf with wool, then again when it was hung on the tree, it has been carried, symbolically, by the wind, and read once more when it was taken down, and again when we laid the leaves out to dry at home. Names and messages of love spoken aloud over and over in the spirit of memory, hope and dedication. The process of preparing the leaves and hanging them has involved a gradual swelling of love and good intentions. We have received private messages from people telling us how much it meant to be able to make a dedication in this way, so we feel that taking the leaves down, even though we thought they might remain for longer, has been a natural, organic process. We may have the ability to add summer, briefly, to a winter tree, but we have no such ability to calm the wind. 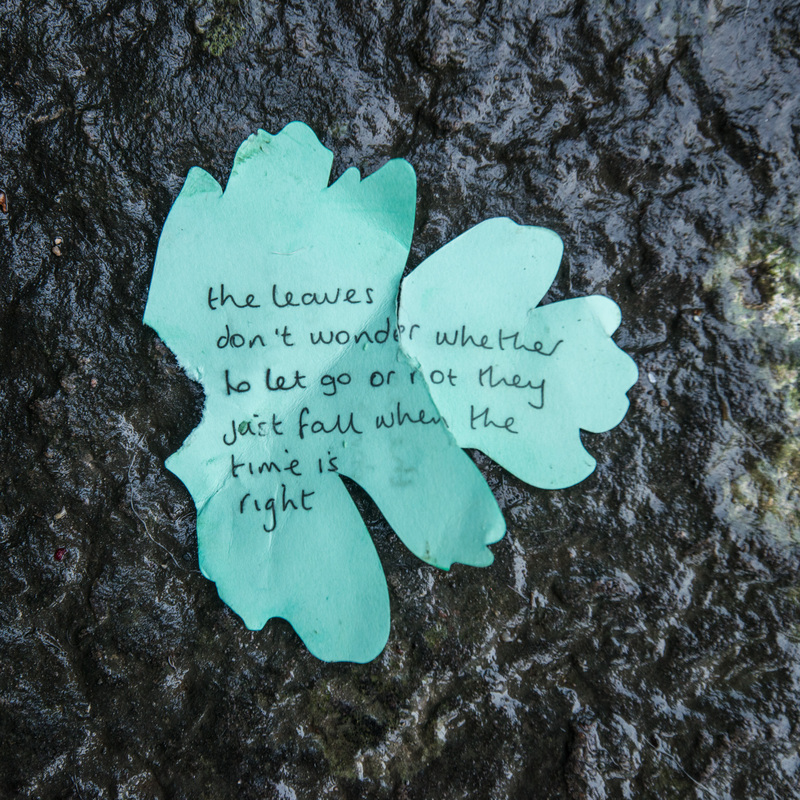 One of the leaves bore the words I’ve quoted above: the leaves don’t wonder whether to let go or not, they just fall when the time is right. It seems that the time was right. A blog about the hanging of the leaves is here. How strange (and yet not? ), that the weather before we hung the leaves and after was filled with the grey or tempestuous moods of winter and yet, during those few hours, as the leaves hung, the mists parted and that glorious, golden sunlight shone; the warmth and love of all those beautiful sentiments reflected back by the universe. Fanciful maybe! But I won’t ever forget and maybe that little, hardy, gnarly tree has something to say to us, if only we could all open or eyes and hearts to listen. I feel I’m sounding a bit hippy now but maybe we could all do with a bit of tree hugging in our lives! Hi Ruth – Yes, Harriet and I were saying exactly the same thing (more or less). 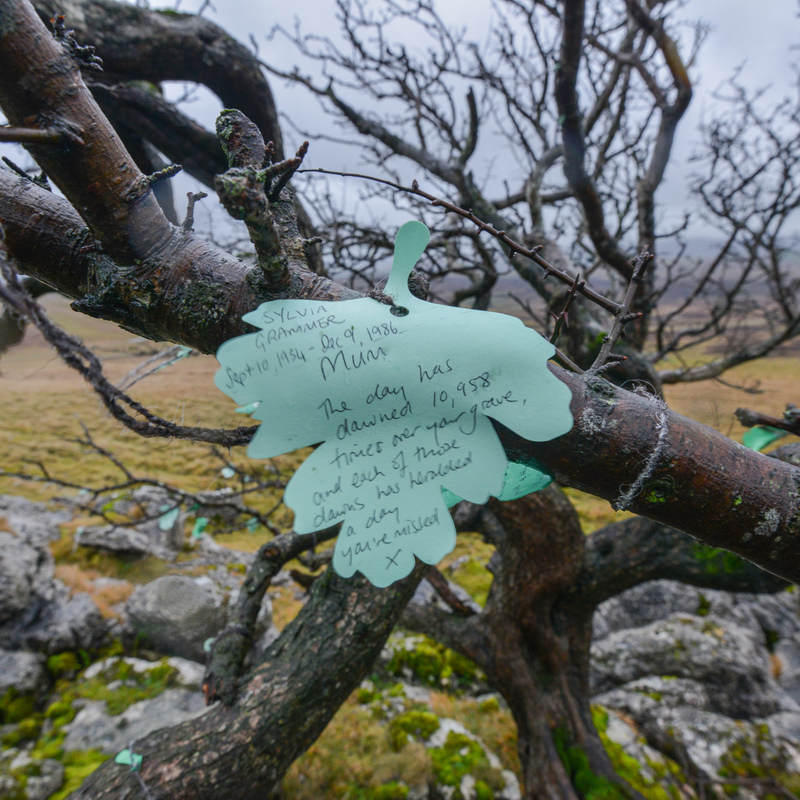 For just a brief window of time the weather allowed for us to be relaxed, calm and totally open to the messages that were being added to the tree. It did feel a touch sad when we got there and saw the few leaves on the ground, but as that one message said, ‘the leaves don’t wonder whether to let go or not, they just fall when the time is right’. We have collected them all together and dried them out. Something will become of them.